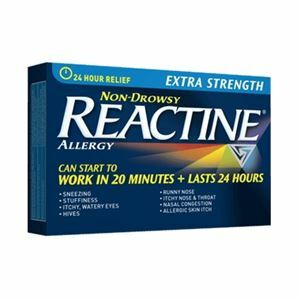 Reactine Allergy Extra Strength provides relief from allergy and is also works as a decongestant when allergies get worse due to sinus symptoms. These Extra Strenth 24 hour tablets start working within 20 minutes and their effect lasts upto 24 hours. For adults and children above 12 years of age, recommended dosage is 1 tablet every 24 hours. For patients above 65 years of age, Reactine regular strength 5 mg tablets are recommended. Reactine tablets can be taken with or without food and should be swallowed whole. Non Medical ingredients include corn starch, hypromellose, lactose, magnesium stearate, polyethylene glycol, povidone, titanium dioxide. Patients suffering from glaucoma, kidney problem, liver problem, enlargement of prostate, high blood pressure, thyroid problem, diabetes, pregnant women and lactating mothers should not take this medicine without consulting their doctor.